Celtic Recycling carefully plans and executes each live-site dismantling operation in a safe, professional and reliable manner. 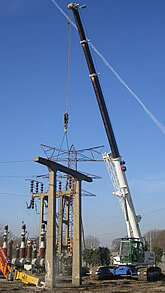 However complex the site access or dismantling requirements, we have the equipment and personnel to assist. Our team of highly trained and dedicated staff provide live-site dismantling and demolition services throughout the UK. Whether the project is the complete dismantlement of a power station, the routine removal of a single plant unit or an emergency response following equipment failure, Celtic Recycling plans and executes the recovery operations expertly, efficiently and safely. Working in a high risk environment poses unique challenges. Our experience in this field is unsurpassed and we draw upon this expertise, coupled with our innovative approach to problem solving to make often complex and difficult situations as straightforward as possible for our clients. We are fully aware of the risks associated with live-site activities and all site staff are required to undertake comprehensive, relevant health, safety and environmental training, including client based training, prior to being approved for working in sub-station environments. For all live-site activities, experienced Celtic Recycling personnel are involved from the outset, working with clients to develop a comprehensive risk assessment and safe work procedure for each stage of the project. Detailed initial site inspections are carried out by our highly experienced estimators whose reports provide the basis for development of our project safe working strategy. Site supervision and communication are of the highest professional standard throughout. Many Celtic Recycling staff are client-accredited Competent Persons and operate in a site supervisory capacity. The company also frequently undertakes the role of Principal Contractor under the Construction (Design and Management) Regulations 2007.